Thessalonica, his heart was drawn out in love to those who had embraced the doctrine of Christ, which subjected them to reproach and persecution. While Paul was still at Corinth, laboring in word and doctrine, and also in the work-shop, Silas and Timothy came from Macedonia. The pleasure of meeting these two faithful co-laborers gave him fresh zeal and courage to withstand the continually increasing opposition, which had greatly [p. 110] hindered his labors. The apostle himself acknowledged that he was in Corinth "in weakness, and in fear, and in much trembling;" but God, "who comforteth those that are cast down," comforted him by the arrival of his friends. God designs that fellow-laborers in the gospel shall have their hearts knit closely together in the bonds of Christian love, so that their presence shall greatly cheer and encourage one another. Paul had sent Timothy to revisit the places of his former labors, and to confirm and establish the church at Thessalonica. Timothy's report was encouraging, and refreshed the spirit of Paul. He was thus prompted to write to these beloved brethren. His first and second epistles to the church are given us. His heart was drawn out in love to those who had embraced the doctrine of Christ, which subjected them to reproach and persecution heretofore unknown to them. There was still another reason for Paul's communication to these brethren. Some who were newly brought into the faith had fallen into errors in regard to those who had died since their conversion. They had hoped that all would witness the second coming of Christ; but they were in great sorrow as one after another of the believers fell under the power of death, making it impossible for them to behold that desirable event,—the coming of Christ in the clouds of heaven. Paul wrote to the church at Thessalonica, greeting them, and invoking in their behalf the blessing of God and the Lord Jesus Christ. He reminded them of his own labors among them, and their acceptance of the word, turning away from idols "to serve the living and true God, and to wait for his Son from Heaven, whom he raised from the dead, even Jesus, which delivered us from the wrath to come." He further referred to his work and that of his fellow-laborers among them, reminding them of the boldness with which they had preached the gospel unto them, in the midst of opposition, abuse, and discouragement, "not as pleasing men, but God, which trieth our heats." Paul then endeavored to inform his Thessalonian brethren concerning the true state of the dead. He speaks of them as asleep,—in a state of unconsciousness: "I would not have you to be ignorant, brethren, concerning them which are asleep, that ye sorrow not, even as others which have no hope. For if we believe that Jesus died and rose again, even so them also which sleep in Jesus will God bring with him. . . . . For the Lord himself shall descend from Heaven with a shout, with the voice of the archangel, and with the trump of God; and the dead in Christ shall rise first. Then we which are alive and remain shall be caught up together with them in the clouds, to meet the Lord in the air; and so shall we ever be with the Lord. Wherefore comfort one another with these words." The friends of the righteous dead should not sorrow as those who lose their loved ones and have no hope in Jesus Christ, and who are not cheered by the immortal future beyond the resurrection of the just. Paul addressed the Thessalonians as [p. 112] those who had turned from the practices of heathen idolatry to the service of Christ. Vague heathen ideas concerning the state of the dead were more or less mingled with the new faith. But those who clearly saw the truth of the resurrection from the dead, in the doctrine preached by Paul, were greatly comforted. The cheering hope which they thus received, that the righteous dead would rise from their graves to a holy, happy immortal life, was in marked contrast with their former pagan ideas of death. For they had believed that there was no future life, no happy meeting with those whom they had loved and lost on earth. The Thessalonians had eagerly grasped the idea that Christ was coming to change the faithful who were alive, and take them to himself. They had carefully guarded the lives of their friends, lest they should die, and lose the blessing which they anticipated at the coming of their Lord. But, one after another, death had laid their loved ones low; and they had buried them from their sight with fear and trembling. All their ancestors had thus been buried, and with anguish the Thessalonians looked upon the faces of their dead for the last time, never expecting to meet them again in a future life. The reception of Paul's epistle was to them a great event. Written communications passing between friends were of very rare occurrence in those times. There was great joy in the church as the epistle was opened and read. What consolation was afforded them by those words which revealed the true state of the dead. Paul therein showed them that those who should be alive when Christ should come would not go to meet their Lord in advance of those who should be asleep in Jesus. [p. 113] For the voice of the archangel and the trump of God should reach the sleeping ones, and the dead in Christ should rise first, before the touch of immortality should be given to the living. "Then we which are alive and remain shall be caught up together with them in the clouds, to meet the Lord in the air; and so shall we ever be with the Lord. Wherefore comfort one another with these words." The hope and joy which this assurance gave to the young church at Thessalonica can scarcely be understood by us. 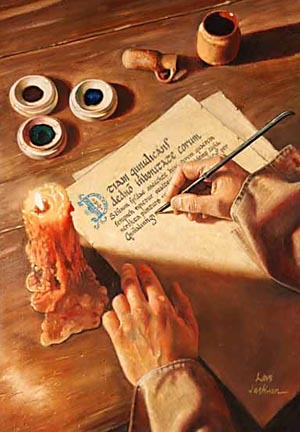 That letter, coming from their father in the gospel, was believed and cherished by them, and their hearts went out in love to him who had brought them the precious light of truth. He had told them these things before; but at that time their minds were grasping doctrines new and surpassingly strange to them, and it is not surprising that the force of some points had not been vividly impressed upon their minds. But they were hungering for truth, and Paul's epistle gave to their souls new hope and strength, a firmer faith in, and a deeper affection for, the Redeemer who had brought life and immortality to light through his death. The darkness that had enshrouded the sepulcher of the dead was dispelled; for they now knew that their believing friends would be resurrected from the grave, and enjoy immortal life in the kingdom of God. A new splendor now crowned the Christian faith, and they saw a new glory in the life, sufferings, death, and resurrection of Christ. Paul wrote, "Even so, them also which sleep in Jesus will God bring with him." Many interpret this passage to mean that the sleeping ones are brought with Christ from Heaven; but Paul designed to be understood that in like manner as [p. 114] Christ was raised from the dead, so will God bring up the sleeping saints with him from their graves, and take them with him to Heaven. Precious consolation! glorious hope! not only to the church of Thessalonica, but to all true Christians who live upon the earth. Paul had previously so fully canvassed the subject of the signs of the times, showing what events would transpire prior to the revelation of the Son of man in the clouds of heaven, that he did not consider it necessary to enter largely upon those particulars again on this occasion. He, however, pointedly referred to his former teachings on that subject: "But of the times and the seasons, brethren, ye have no need that I write unto you; for yourselves know perfectly that the day of the Lord so cometh as a thief in the night. For when they shall say, Peace and safety, then sudden destruction cometh upon them." The careless and unbelieving close their eyes to the evidence which Christ has given to warn men of his coming. They seek to quiet all apprehension, while, at the same time, the signs of the end are rapidly fulfilling, and the world is hastening to the period of the revelation of the Son of man in the clouds of heaven. But those who receive the light of truth as it shines upon their pathway, are not in darkness that this great event should come upon them unawares. Paul teaches that it would be sinful to be indifferent to the signs which should precede the second coming of Christ. Those who should be guilty of this neglect, he calls children of the night and of darkness. He encourages the vigilant and watchful with these words: "But ye, brethren, [p. 115] are not in darkness, that that day should overtake you as a thief. Ye are all the children of light, and the children of the day; we are not of the night, nor of darkness. Therefore let us not sleep, as do others; but let us watch and be sober." The teachings of the apostle upon this point are especially important to the church in our time. Above all others, those who are living so near to the great consummation, should be sober and watchful. The watchful Christian is a working Christian, seeking zealously to purify his life, and to do all in his power for the cause of God. As his love for his Redeemer increases, so also does his love for his fellow-creatures increase. He has severe trials, as did his Master; and, like him, he is to some extent a man of sorrows, mourning because of the abominations done in the land. But this grief does not sour his temper, nor destroy his peace of mind. His afflictions, if well borne, refine and purify his nature. He is thus brought into closer fellowship with Christ; and inasmuch as he, through fierce opposition, is a partaker of the sufferings of Christ, he will also be a partaker of his consolation, and finally a sharer of his glory. Paul continued his admonition to the church: "We beseech you, brethren, to know them which labor among you, and are over you in the Lord, and admonish you; and to esteem them very highly in love for their work's sake. And be at peace among yourselves." The Thessalonians were greatly annoyed by persons coming among them with fanatical ideas and doctrines. The church had been properly organized, and officers had been appointed to act [p. 116] as ministers and deacons. But some would not be subordinate to those who held authoritative positions in the church. Ardent, self-willed persons claimed not only the right of private judgment, but to be heard publicly in urging their views upon the church. Paul, therefore, earnestly called the attention of his brethren to the respect and deference due those who had authority in the church, and who had been intrusted with the responsibilities connected with it. He cautions the Thessalonians not to despise the gift of prophecy, and enjoins a careful discrimination in distinguishing the false manifestation from the true: "Quench not the Spirit; despise not prophesyings; prove all things; hold fast that which is good." He prays that God will sanctify them wholly, that their "whole spirit and soul and body be preserved blameless unto the coming of our Lord Jesus Christ;" and in closing, adds the assurance, "Faithful is He that calleth you, who also will do it." In this First Epistle to the Thessalonians, Paul's teachings concerning the second coming of Christ were in perfect harmony with his former instructions to the church. Yet his words were misapprehended by some of the Thessalonian brethren. They understood him to express the hope that he himself would live to witness the Saviour's advent. This belief served to increase their enthusiasm and excitement. Those who had previously neglected their cares and duties, now considered themselves sustained by the apostle; hence they became more persistent than before in urging their erroneous views. In his second letter to this church, Paul seeks to correct their misapprehensions, and to set before [p. 117] them his true position. He expresses his confidence in their Christian integrity, and his gratitude to God that their faith was not waning, and that love abounded toward one another, and for the cause of their divine Master. He also states that he presents them to other churches as furnishing a sample of the patient and persevering faith which bravely withstands the persecution and tribulation brought upon them by the opposition of the enemies of God. He carries them forward to hope for rest from all their cares and perplexities, when the Lord Jesus shall be revealed, "in flaming fire taking vengeance on them that know not God, and that obey not the gospel of our Lord Jesus Christ." He then showed that great events were to transpire in the future, as foretold in prophecy, before Christ should come. Said the apostle: "Be not soon shaken in mind, nor be troubled, neither by spirit, nor by word, nor by letter as from us, as that the day of Christ is at hand. Let no man deceive you by any means; for that day shall not come, except there come a falling away first, and that man of sin be revealed." The papal power, so clearly described by the prophet Daniel, was yet to rise, and wage war against God's people, and trample upon his law. Until this power should have performed its deadly and blasphemous work, it would be vain for the church to look for the coming of their Lord. Thus Paul put to naught the arguments of those who represented him as teaching that the day of Christ was at hand. He charged his brethren not to neglect their duties and resign themselves to idle waiting. After their glowing anticipations of immediate deliverance, the round [p. 118] of daily life and the opposition which they must expect to meet, would appear doubly forbidding. He therefore exhorted them to steadfastness in the faith. Their work had been appointed them of God; by their faithful adherence to the truth they were to communicate to others the light which they had received. He bade them not to become weary in well-doing, and pointed them to his own example of diligence in temporal matters while laboring with untiring zeal in the cause of Christ. He reproved those who had given themselves up to sloth and aimless excitement, and directed that "with quietness they work, and eat their own bread." He also enjoined upon the church to separate from their fellowship any who should persist in disregarding his instructions. "Yet," he added, "count him not as an enemy, but admonish him as a brother." He concluded this epistle also with a prayer, that amid life's toils and trials the peace of God and the grace of the Lord Jesus Christ might be their consolation and support. Click here to read the next chapter: "Apollos at Corinth"